Hey, lovelies - the most wonderful time of year is back! This means Christmas carols, holiday shopping, and of course, tons of travels for most! I'm pretty lucky in the sense that a large part of my family lives in New York, so I don't have to do a ton of traveling for the holidays. But for those who do, or just happen to be taking a vaca this fall, I've got some colder weather packing hacks for you today! It's sort of on the nose, but I’d the say the most common mistake made when traveling is opting for heavier suitcases. SO-MUCH-WASTED-WEIGHT! Let’s start here- invest in a light weight luggage duo - carry on and checked bag - that’s durable and easy to trot around. This will not only make your life easier when you find yourself going up countless flights of stairs in that elevator-less Airbnb you booked to save yourself a couple of coins, but it will also make packing for your trip way easier. Just think about it this way, the less your luggage weights, the more packing you can get away with. And trust me, those overweight charges are not cute! You know what is cute, however? The below luggage sets from Mark and Graham. 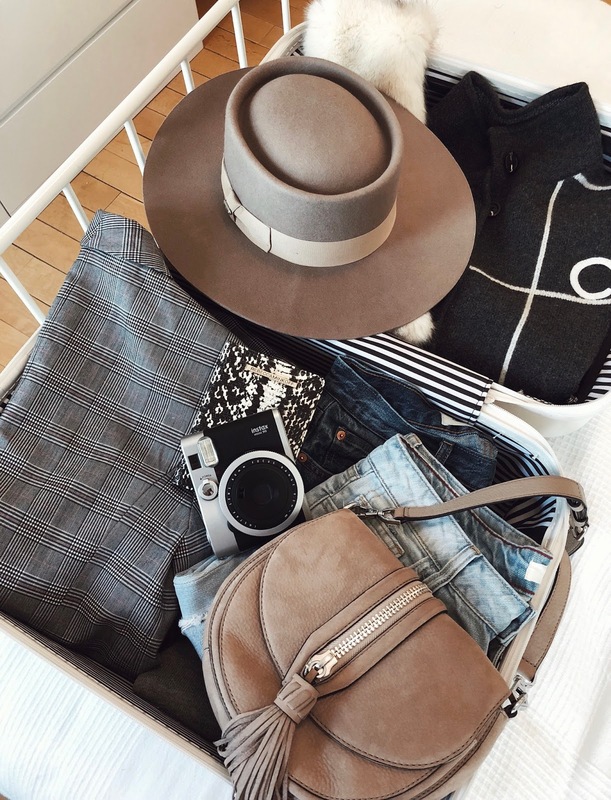 Ok so this hack won't *actually* make your luggage lighter, but it does help better visualize what you've got in your bag for when it's time to edit down because you've gone overboard with the sweaters and leather jackets. Totally not speaking from personal experience here. hehe! This also helps keep all your clothing nice and tidy (sans wrinkles) when you're on the move! If you're like me, you have the hardest time choosing between pieces - even if they're similar (read: exact same thing). Like, what do you mean I can only pack my scoop neck striped sweater but not my boater neck striped sweater?! Tragic. When packing for my Spain trip just two nights ago I tried this new rule where I only allowed myself to pack one of each piece, per category. Meaning, I can't just throw in five white tees, close my eyes and hope for the best when I get to bag check. I narrowed it down to one coat, one sweater, one pair of flats, etc.. The only exception to this rule were jeans, because jean freak here. Alright guys, that's all I have for now. Let me know in the comments if you're heading anywhere this holiday season! Great hacks, that picture is so cute as well! Super helpful tips, Im all about rolling! All about that roll life here!